Before purchasing a diamond, you should expect to review a copy of its GIA certification as proof that it has undergone an unbiased, professional examination. But not all gemological laboratories are the same and while their terminology is the same, the physical diamond may not be the same because they apply the standards more leniently or more strictly. This explains, in part, while certain diamonds which "appear" to be identical on paper are priced very differently and will have different values and desirabilities. See Two Identical Diamonds-But with Different Prices? What is a GIA Diamond Grading? A GIA diamond certification issued by the Gemological Institute of America (GIA), also called a Diamond Grading Report or Diamond Dossier® is a report created by a team of gemologists. The diamond is evaluated, measured, and scrutinized using trained eyes, a jeweler’s loupe, a microscope, and other industry tools. A completed certificate includes a description of the diamond’s dimensions, clarity, color, polish, symmetry, and other characteristics. Many round diamonds will also include a cut grade on the report. It is a mechanically generated report and no judgment is made by the graders as to the desirability of the diamond. Every loose diamond which A. Fishman & Son will sell you has been graded by the GIA. This is the most respected laboratory in the diamond industry and is known for their consistency and unbiased diamond grading reports. Diamonds that are accompanied by GIA grading reports are the most highly valued in the industry. We do not own or sell diamonds certified by the European Gemological Laboratory (EGL). We recommend that you NOT purchase diamonds graded by this laboratory as they apply the grading standards more leniently than the GIA. As a result, diamonds graded by the EGL are not as good a quality as the certificate might seem to indicate. Also, see Two Identical Diamonds-But with Different Prices? A Diamond Grading Report documents the specific characteristics of a diamond.These reports are issued by the GIA, which is the most respected organization in the diamond industry. 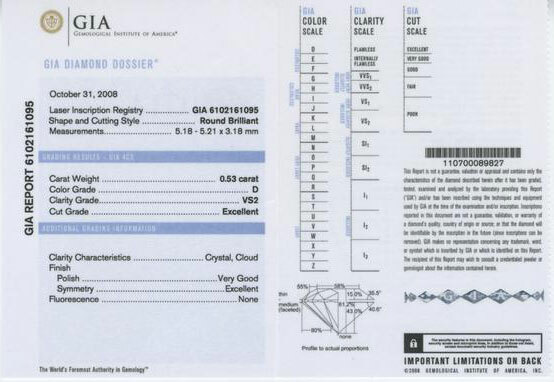 A Diamond Dossier®, issued by the GIA, is a special report issued for diamonds weighing less than 1 carat. It does not contain a Clarity Plot showing where the inclusions are in the diamond. Instead, it lists the nature of the inclusions and has a Laser Inscription Registry inscribed in the diamond for identification purposes. Otherwise, it contains the same information as the full Diamond Grading Report. Shape: The diamond's shape is its form when viewed from above. See Diamond Shape Guide. Measurements: The Certificate lists the diamond's dimensions in millimeters. For a round diamond it is its minimum and maximum diameter and its depth. Carat Weight: The weight of a diamond is listed to the nearest hundredth of a carat. See Diamond Carat Size. Color Grade: Color describes the degree to which a yellow hue is present or absent in a diamond. See Diamond Color. Clarity Grade: Clarity describes the degree to which blemishes or inclusions are present or absent in a diamond under 10x magnification. See Diamond Clarity. Cut Grade: A grade of cut as determined by a diamond's face-up appearance, design and craftsmanship. A cut grade is available on round diamonds graded after Jan. 1, 2006. Cut is an overall description of the light reflecting properties of a diamond. See Diamond Cut and GIA Cut Grades. Depth %: The depth percentage compares the diamond's depth to its diameter. The ideal depth percentage depends on the chosen shape. Table %: The table percentage compares the width of the table to the width of the girdle. The ideal table percentage depends on the chosen shape. Girdle: Range of girdle thickness. The girdle is the faceted area which separates the top of the diamond (the "crown") from the bottom of the diamond (the "pavilion). Culet: Appearance, or lack thereof, of the culet facet. The culet facet is the pointed facet at the bottom of the diamond. In a diamond, that facet may not be present, in which case the culet characteristic is "None." Polish: Polish describes the smoothness of a diamond's facets. A high-quality polish will leave little to no scratches and marks for maximum brilliance. Symmetry: Symmetry describes the degree to which a diamond's facets are properly aligned. A symmetrical diamond emits high levels of fire and brilliance. Fluorescence: Diamonds may display varying amounts of fluorescence, which causes them to emit a soft, bluish glow when exposed to UV light. The Fluorescence grade describes the color, and strength of color when a diamond is viewed under UV light. Clarity Plot: A map of the approximate size, type, and position of inclusions as viewed under a microscope. A Clarity Plot does not appear on a Diamond Dossier®. Proportion Diagram: A map of the diamond's actual proportions. 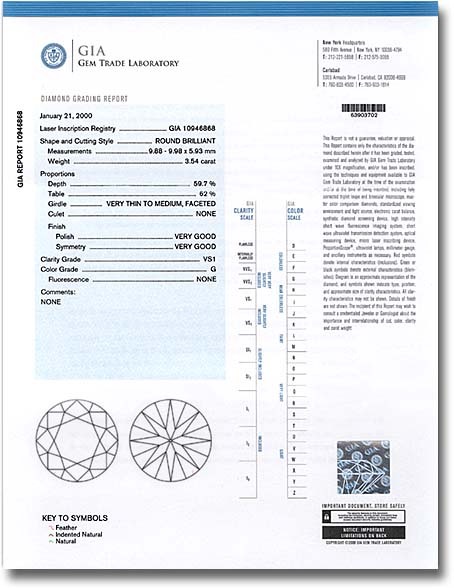 A diagram is available on round diamonds graded after Jan. 1, 2006. 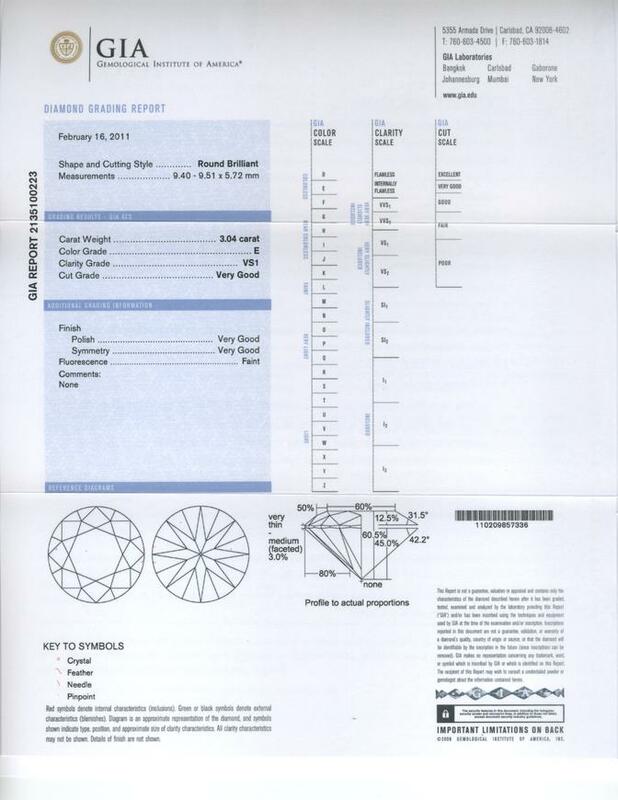 Click Here to see an example of a GIA Diamond Grading report for one of our diamonds. 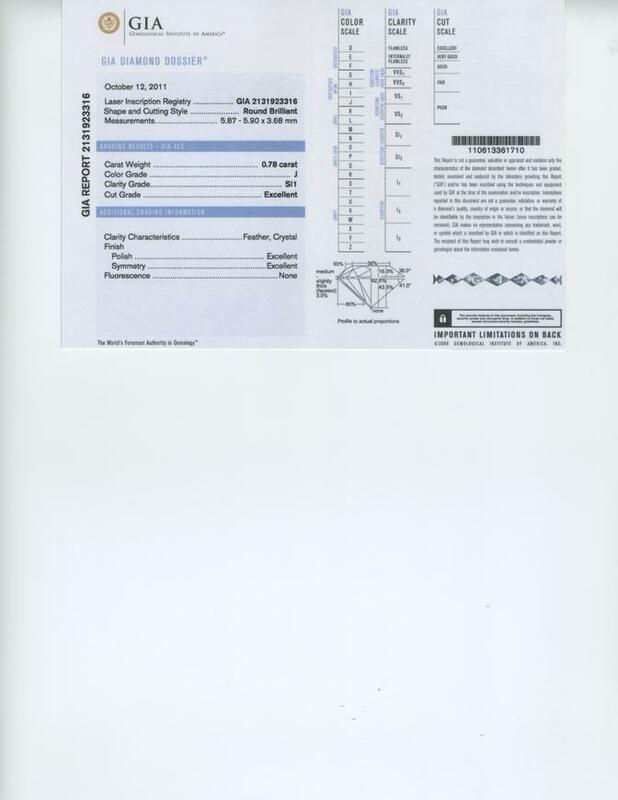 Click Here to see an example of a GIA Diamond Dossier® for one of our diamond. It would be a mistake to rely solely on the diamond certificate when buying a diamond. See Beyond the 4 C's: What You Should Really Know Before You Buy a Diamond. If you are interested in a specific certified diamond at A. Fishman & Son you can view its certificate on our site before purchase. If you are interested in a specific certified diamond at A. Fishman & Son you can view an actual photograph of that diamond on our site before purchase.